ALPHA OMEGA Management Launches New Format Record Label: ALPHA OMEGA Records! A new record label, why? What does a band really need from a record label nowadays???? Promotion first of all, a real one, through our worldwide management network! It’s an alliance of some of the most active entities of the web and the real world # for example: METALHEADS FOREVER, TOVAR Music Group, alongside some of the strongest Facebook groups (at the moment almost 3 millions subscribers, in all)! Promotion, like ours is a joint venture of many cool realities participating to the success of the communication through the channels where the real die hard fans and the real professionals are going. Physical copies …how many times the up and coming bands get offers where they could get in advance only a ridiculous amount of copies so the label can sell them later on at ridicolous prices more copies ? We give all the CDs to the band immediately, because that’s where the band makes its incomings. Discounts with worldwide known producers and studios. Special deals with ALPHA OMEGA Management to get live promotion through huge support slots. Special deals with graphic art designers for the artwork of your CD. If it’s true that nowadays digital is increasingly supplanting the physical product, it’s also true that this happens mainly on Mass Market products, i.e. products intended for a fast market generally addressed to disinterested public that doesn’t need a deepening or an emotionality whick is fundamental, and still very pertinent in the areas not yet polluted by this type of commercial policy like ours. Alpha Omega Records deal with the professional production of whatsoever support requested by the Band, following its preparation and working processes, proposing it at the right price and certainly below the market standards, and through the Networking created by Alpha Omega and through a truly unlimited promotion, it will canalize the product sale directly to the Artists’ channels. In a nutshell we will not distribute your discs, we will not send 5 pieces to every nation saying that we have a capillary distribution, that would be a false promise, but thanks to Alpha Omega’s Network, we will make your discs searched directly on your sales channels. Without intermediaries, without interference. We are of the idea that today, in this fast-paced world, anyone who can be intrigued by the music of an artist, first connects to the social network of the artist himself, and generally the curiosity about an Artist increases the possibility of an impulse purchase by 80%, and it is there the product sells, directly managed by the artist himself. Feel free to ask us further information, we are at your disposal, for an only goal: to promote your band, your records, protecting your rights, which remain absolutely yours, while you can enjoy an unprecedented global promotion. All News & Announcements on Facebook! Please note! To read all our news and announcements, follow us on Facebook, HERE! Stay tuned! 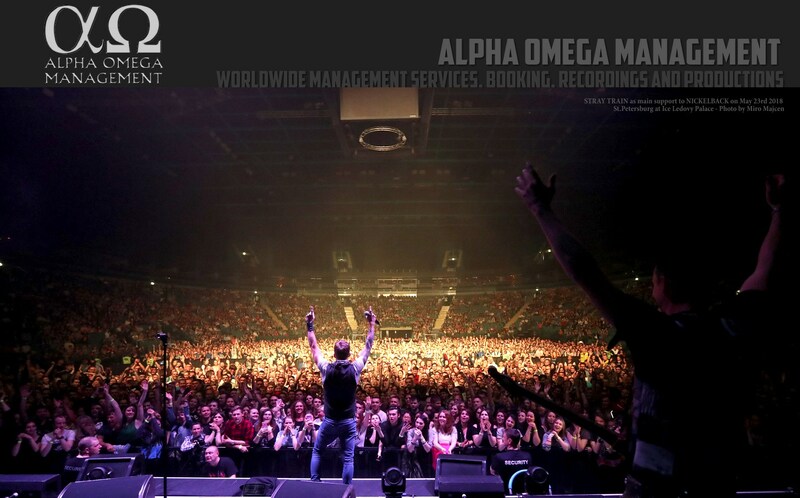 ALPHA OMEGA Management And TOVAR Music Group Announcing Worldwide Partnership! ALPHA OMEGA Management is extremely delighted to announce that TOVAR Music Group (aka TMG, led by John Tovar, former long time manager of MARILYN MANSON) and ALPHA OMEGA Management have merged forces for a global partnership! John Tovar has been in the music business more than 35 years. The music is in the DNA of the Tovar family. The experiences gave him the ear for true talents, who have become extremely successful international acts, regardless of their musical styles. ALPHA OMEGA Management and METALHEADS FOREVER Announcing the Birth of Their Worldwide Management Network! BILL HUDSON Signs Worldwide Artist Deal With ALPHA OMEGA Management! TESTAMENT’s STEVE DI GIORGIO Signs Worldwide Artist Deal With ALPHA OMEGA Management!